For many years, Penn students could expect the knowing gaze of William Shakespeare to greet them as they entered Fisher-Bennett Hall, home of the English department. The Bard’s monumental portrait had hung above the main staircase for decades, and over the years had accrued a smattering of lipstick marks where anonymous English lovers had kissed his likeness. But in December a group of students removed the portrait from its mount and delivered it to the office of department chair Jed Esty, the Vartan Gregorian Professor of English. In Shakespeare’s place, the students hung a temporary portrait of Audre Lorde, the black feminist author and civil rights activist. College senior Nora Henrie is an English major and a member of the Underground Shakespeare Company, a Penn theater group dedicated exclusively to performing the works of Shakespeare and his contemporaries. She said she had not heard any complaints about the switch. “Shakespeare isn’t hugely represented in our classes, or usually when he is, it’s for cross-literary analysis. In general, there’s a lot of leeriness about traditional canons in English literature,” she said. Henrie sees Lorde’s portrait as more symbolic of a modern curriculum. A minority of students find the portrait’s removal symbolic of a greater cultural shift. Nayeli Riano, another senior studying English, penned an article for National Review titled “Banishing the Bard,” lambasting the department’s decision. The portrait’s removal has no bearing on undergraduates’ opportunity to study Shakespeare. This year’s course catalogue lists four courses dedicated to the study of Shakespeare; additional offerings cover his work as part of wider surveys. This isn’t the first time Shakespeare’s portrait has disappeared. A 1998 student prank left administrators scratching their heads when the giant portrait vanished at the end of April, only to reappear in the arms of triumphant graduating English majors on Commencement morning [“Gazetteer,” Sept|Oct 1998]. Interestingly, before that theft was revealed to be a lighthearted prank, some faculty interpreted it as a political statement in the same vein as the December removal. They came to this conclusion upon finding a collage of women writers in Shakespeare’s place. Yet the pranksters had exposed this artifact unwittingly. Students had pasted these photocopied portraits to the wall during the 1994-95 school year, when the canvas was taken down for cleaning, and those images were simply left on the wall behind the portrait when it was remounted. Clearly, Shakespeare’s place of honor on the stairwell has been on students’ minds for longer than the past election cycle. 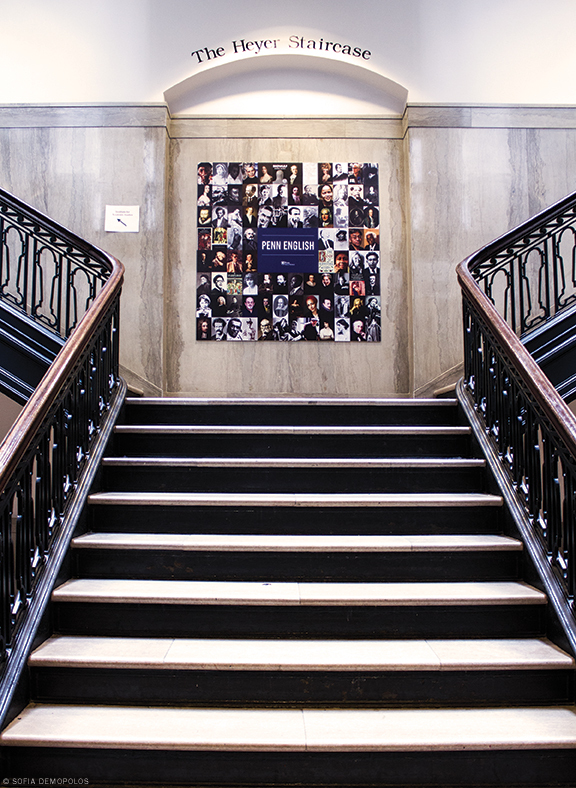 With this in mind, the department has replaced the Audre Lorde portrait with a more inclusive collage of writer likenesses and literary works. From Thomas Mallory and Christine de Pisan, to Zora Neale Hurston and Zadie Smith, the faces of authors of many eras and origins now grace the most coveted wall-space in Fisher-Bennett Hall. Among them are both Lorde and Shakespeare—only a little smaller, and immersed in larger company.